I will give you the biggest name that is rumored to be in final negotiations first, Robert freaking DeNiro! Wow, cool beans! Now if DeNiro does infact sign on the film, it won't be the biggest shock. Remember Tarantino and DeNiro are buddies as is Rodriguez with QT, so isn't too far off to think, RR asked QT to hit up DeNiro about starring in "Machete". Bloody Disgusting reports that DeNiro would play Senator McLaughlin. McLaughlin is the character that double-crosses Machete forcing him into a bloody rampage. The rest of the names that are being reported (as rumors for now) are Jonah Hill, Michelle Rodriguez, Lindsay Lohan and finally Steven Segeal. Out of all of these names, I'm sure Segeal stands out the most. Having Steven Segeal sign on to "Machete" would be an interesting addition to say the least. Jonah Hill is rumored to be playing Julio, while Michelle Rodriguez would play Luz. No mention of exactly who Lohan would play, but she could be up for the same role as Rodriguez. Now, none of these names are finalized at all. 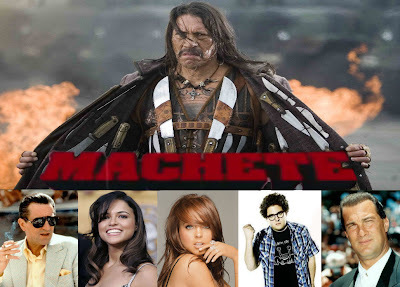 No deals are done, but with RR planning on starting by the end of July, we can plan on seeing the cast of "Machete" finalized very shortly.